A boat survey is necessary for many reasons. Most of the time they are used for pre-purchase and insuring purposes. However when seriously considering the purchase of a new sailing or power vessel (no matter what the size) a survey should be performed on the vessel so you know exactly what you are getting before you purchase the vessel. Also the survey will include a replacement cost and valuation of the vessel that pertains to its current condition compared to other vessels in that reigon of the country. You should never negotiate the purchase price of the vessel until you have your own completed survey in your hands, even if the seller is offering a recent survey of the vessel. These are two professional organizations of marine surveyors that most insurance companies recognize and accept marine surveys from. These organizations have strict training, standards, and ethics guidelines that they require to belong to these organizations. There is a list of qualified marine surveyors on both of these websites to choose from based on their location. Once you find a local surveyor, their email addresses and links to their websites (if they have one) are listed. Once you have selected a marine surveyor, look over their website if they have one. See if you can find a sample survey. A good survey should look professional and be thorough and complete from bow to stern. (I will mention more about this later on). If they do not have a website, call them. The surveyor should patiently answer all of your questions and quote you a rate over the phone. Most surveyors will typically charge by the foot (typically from $15.00 – $20.00 a foot) however a few surveyors will quote a rate on the job as a whole. Keep in mind that the price is not the key thing you should focus on. In the case of finding a good marine surveyor, a quality surveyor is much more important than the cost of the survey. A low quality survey can cost you thousands of dollars in missed damage or problems on the vessel that you may not discover until months later. Do your homework and talk to the surveyor before you decide to hire him for the survey. Just listen to your “spidey senses” as you research a surveyor you’re thinking about using. 1. 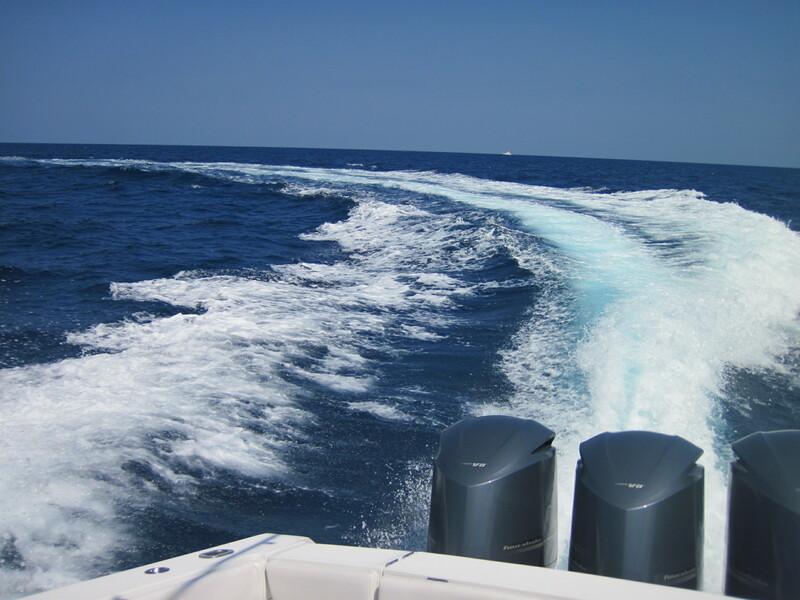 When starting the engines make sure the engine has overboard raw water discharge coming from the exhaust. The exhaust should be slightly white. Any other color could mean somethng minor to major. 2. During the sea trial run the engines at about 85% of their max for a few minutes. Note to be sure that the vessel is not overheating or studdering. If your vessel has twin engines, make sure as you move the throttles up evenly so you can verify that the engines engage evenly. 3. When backing down on the engines, do so quickly and have the surveyor watch the engines each time. If a motor mount is loose or off completely you will see the motor “jump” when suddenly backing down even if you can not sight the mount at all. 4. A good surveyor will have a moisture meter with him. Have the top sides, deck, and superstrutcture checked for excessive mositure which may be a pre-curser of delamination and wood rot in the core between the fiberglass. 5. As far as going aloft on the mast. Do not expect all surveyors to do this. Some masts I have encountered were so old and corroded I was not going to bet my life that the gear was going to hold my weight. In those cases I have a 12 megapixel digital camera with a 10x zoom and I will photograph the top rigging and later will take it home and zoom into the those areas on the computer to look for corroded parts. The absolute best bet, is to have the boat in the yard and take the mast down to inspect it up close. Although I know many boaters do not want to spend that kind of money. 6. 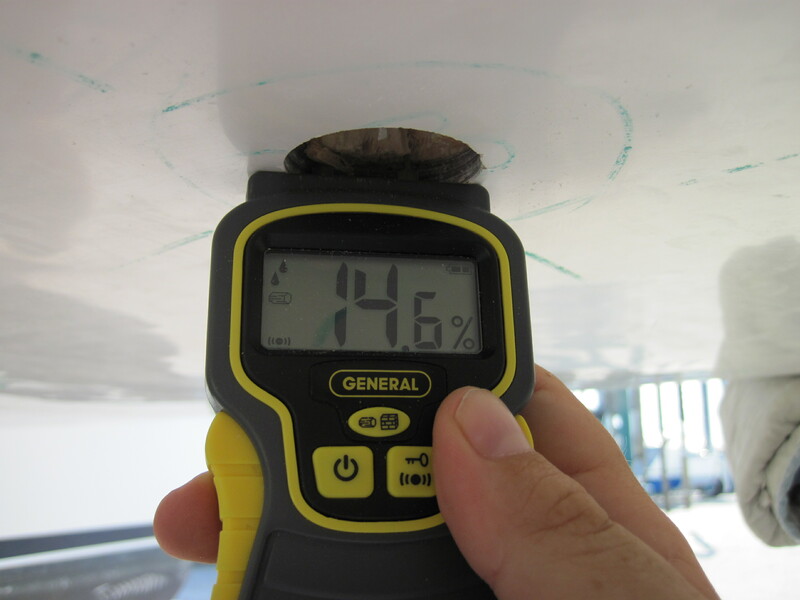 Look for signs of delamination and crazing on the interior and exterior of the hull. Delamination may look off white, brown, or orange in color under the gel coat of a fiberglass hull and is typically in a small circle or oval shape where the fiberglass layers are separating. Crazing is that fractured cracking in the gel coat. Sometimes it is in the form of spider web like fractures moving out over the surface of the gel coat in a circular pattern. 7. In many marinas galvanic corrosion is an enemy to many boats. I have seen this especially in the Caribbean where electrical standards are not exactly up to par like they are in the United States. Look for discoloration on underwater stainless steel parts or areas on metal under the water line that are pitted. This is an indication of galvanic corrosion that is pulling less resistive metals out of the steel such as zinc and magnesium. 8. Electrically, look to be sure that the wiring is marine grade cable and it should be labeled on the insulation. There should be an “AWG” rating (American Wire Gauge) of at least 16 on most of the instrument wiring. Be sure battery terminals are protected and have no more than four connections on the positive terminal. Electrical connections should not have reverse polarity when checked. No wing nuts or wire caps! 9. All seacocks should be able to open and close with little effort. If the valve is frozen, replace the seacock. No gate valves should be on the vessel. When I was in the Coast Guard, the number one reason we saw vessels sink at the docks was from open seacocks that failed or had attaching lines that failed. When not in use, shut them off! 10. In the survey report, everything that was checked should be written in detail. There should be a cover page, table of contents specifying the vessel’s systems, a findings and recommendations section, a hull diagram with a list of seacock locations and vents, a replacement cost and valuation sheet, a signature page for the surveyor, and plenty of photos throughout the survey especially where findings are discovered. What it should not look like is a five page boat check off sheet. Remember that the surveyor can only note what he can see. It is not a contest. Let him know everything you have observed on the vessel even if he may miss it. A good surveyor will typically spend at least 5-8 hours on scene going through your vessel (given an average length of 30 feet). Longer vessels may take longer. I recently did a survey on a 76 foot wooden ketch, which took me 16 hours (two days) to go through, and on the second day I brought a wood boat builder to get his opinion on some unique findings on that vessel. These are only some of the things I look for on a marine survey. But I hope the few things I have written here has shed some light on what to observe during a marine survey. As I have said earlier in this article, when shopping for a surveyor, many of them will have sample reports on their websites. They should look professional and be thorough in their content. Their rates are secondary. Sometimes going with the cheapest, well… you may end up getting what you pay for as the old saying goes. I have seen excellent work from some surveyors, and a few others I have seen the five page boat check offs I have mentioned before. Do not be afraid to ask the surveyor questions about anything that comes to mind during the survey. A good marine surveyor will be more than happy to answer your questions during the survey. 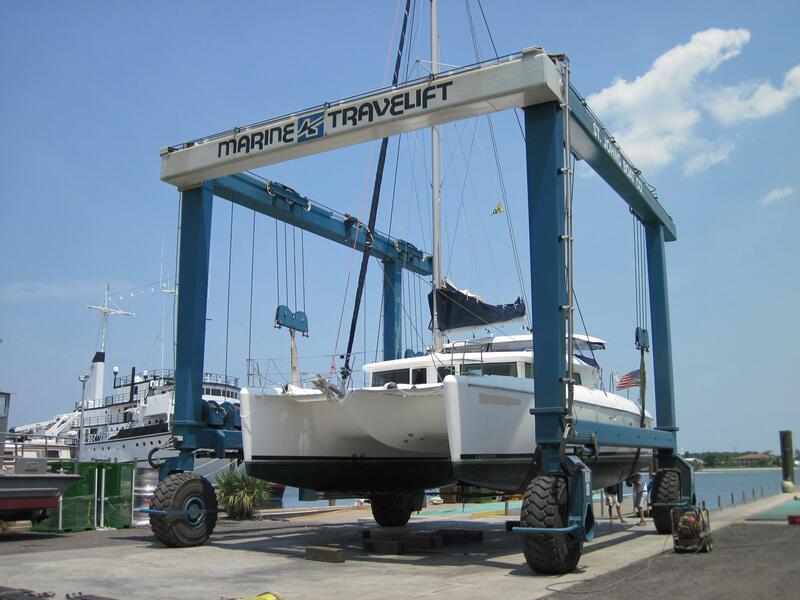 With my personal experience as a boat owner, I have learned alot just from watching and questioning marine surveyors, marine electricians, and boat mechanics about things they were doing on my boat. Owning a boat can be expensive at times, but the education and adventure you have aboard it should be fun and memorable. I am always excited for new boat owners and I am more than happy to impart any knowledge that I can give to them while on surveys or serving as a captain aboard a vessel. Until I write again, enjoy the water, be safe, and fair winds! This entry was posted in Corrosion survey, Florida Marine Surveyor, Fort Lauderdale Thermal Imaging, Insurance survey, Marine Surveying, marine surveying thermal imaging and tagged Captain, fort lauderdale marine surveyor, marine surveyor boca raton, marine surveyor florida, marine surveyor florida keys, marine surveyor fort pierce, marine surveyor hobe sound, marine surveyor jupiter, marine surveyor key west, marine surveyor palm beach gardens, marine surveyor pompano beach, marine surveyor port saint lucie, marine surveyor tequesta, miami marine surveyor, sailboat, sailing, stuart marine surveyor, west palm beach marine surveyor. Bookmark the permalink.